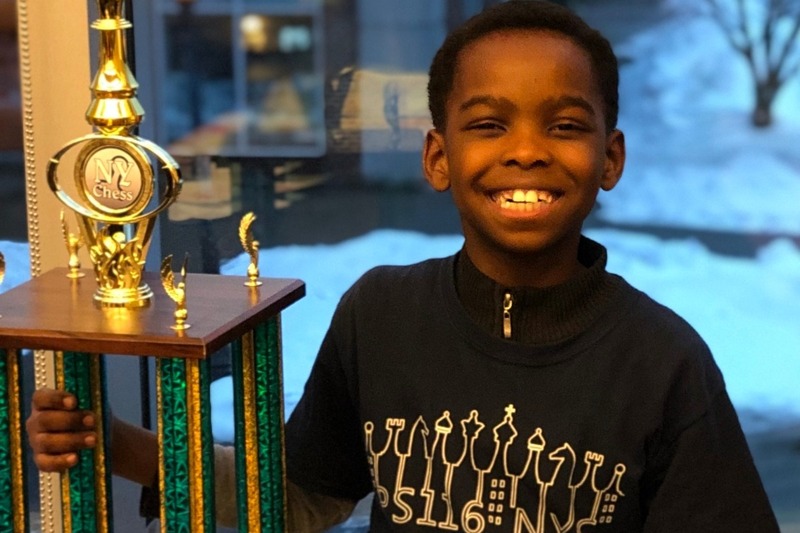 Have you heard about the 8 year old Nigerian refugee living in a NYC homeless shelter who took first place in the NYS Scholastic Chess Championship for his age bracket? This is a story of hard work, perseverance, and kindness to share with your sons and daughters. Eight year old Tanitoluwa Adewumi, who is known as Tani, came with his family to New York City in 2017 after they fled Northern Nigeria under the threat of religious persecution. They took up residence in a Manhattan homeless shelter and Tani enrolled in P.S. 116, where he was introduced to the game of chess by the school’s chess coach. When the coach saw how quickly and well Tani learned the game, he invited Tani to join the school’s chess club, and waived the membership fees. Less than two years later, Tani has seven chess trophies and is the New York State champ. Tani’s goal? To become the youngest grandmaster, which his coach predicts could happen in a year or two. This is a wonderful story of how a young man’s talent, fueled by grit and hard work, is yielding great results. It is also the story of his parents dedication to helping him succeed: his mother, who recently passed the test to become a home health aide, and his father, who rents a car that he drives for Uber and is a licensed real estate salesman, are doing all they can to help Tani. His mother, who initially reached out to the chess coach to ask if Tani could join the chess club, takes Tani to a free three hour practice session in Harlem every Saturday and attends all his tournaments. His father gives him his laptop every evening to practice. As the school’s principal notes in the NY Times article that introduced us all to Tani, while Tani may not have a home, he has two parents who are enormously supportive of him and his dream. This is also the story of the power of kindness and generosity. As noted above, Tani’s story initially came to light a few days ago via a story written by NY Times columnist Nicholas Kristof. Since then it has been covered by a number of news outlets, including NBC Nightly News and USA Today. After a number of people left comments on the NY Times story asking if they could help the Adewumi family, the chess coach set up a Go Fund Me account for Tani and his family with a goal of raising $50,000. In four days the account has raised over $179,000, and it continues to grow. The family has posted its heartfelt gratitude for this generosity on the Go Fund Me page, and are setting up the Tanitoluwa Adewumi Foundation to receive these funds. Meanwhile, Tani spends his evenings practicing chess on his dad’s computer, preparing for the elementary national championship in May. An 8 year old homeless boy with an aptitude for chess and the grit and determination to be the best at it has caring supportive parents, and now the kindness of thousands of strangers, in his corner. This story should inspire us all.